On September 19, 2018, Federal Motor Carrier Safety Administration (FMCSA) published the Qualification of Drivers; Diabetes Standard final rule adopting a revised physical qualification standard for operators of commercial motor vehicles (CMVs) with insulin-treated diabetes mellitus (ITDM) (83 FR 47486). 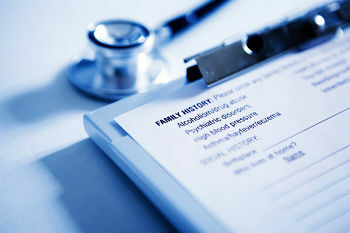 The revised standard lifts the blanket prohibition on insulin use and provides that Certified Medical Examiners may evaluate and determine, with input from the treating clinician, whether to issue a Medical Examiner's Certificate, MCSA-5876, to qualify the driver to operate a commercial motor vehicle in interstate commerce. The effective date of this final rule is November 19, 2018. In light of the final rule, FMCSA has determined that an exemption program for ITDM individuals is no longer necessary. The Agency intends to publish a Federal Register notice to withdraw the 2003 final disposition (68 FR 52441) and the 2005 revised final disposition (70 FR 67777) notices concerning the decision to issue exemptions to certain ITDM individuals. 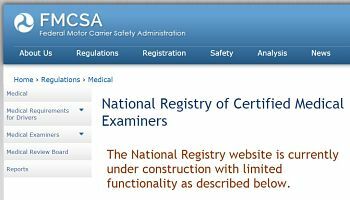 Once published, FMCSA will send notification to all Certified Medical Examiners. The NRCME Training Online program and spiral bound study guide book have been updated to reflect changes in the 2019 Diabetes Standards. 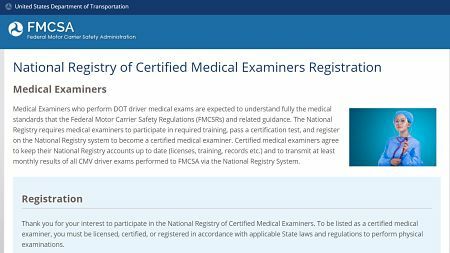 As a result of the unexpected delays in posting the final versions of the newly revised driver examination forms and recognizing that MEs need to have access to the forms prior to the effective date for a number of reasons, FMCSA will allow MEs to use both the current and newly revised versions of the Medical Examination Report Form and Medical Examiner's Certificate from December 22, 2015 until April 20, 2016.